Halitosis literally means bad breath, but the term is often used to describe a chronic problem. Bad breath is experienced by almost everybody at some point. Eating pungent foods, using poor dental hygiene and other habits can cause bad breath. However, certain conditions can cause foul breath to linger for weeks, months or even years. Here’s a look at the differences between bad breath and halitosis and some of the most effective Halitosis Treatments for each. Plenty of activities and foods can cause foul breath. Most people have experienced the effects of garlic on their breath, for example. Spicy foods, such as exotic curry dishes, can turn a breath bad for hour afterwards. These foods aren’t problems when they’re eaten at home, but they can ruin a night out with friends or a date. As a result, many people avoid eating these dishes unless they’re alone or can brush afterwards. Dry mouth is a major cause of bad breath. Several habits can reduce salivary production in the mouth, including mouth breathing, smoking and drinking alcohol. Mouth breathing may occur during exercise or out of habit, but it’s guaranteed to reduce salivary flow and encourage tooth decay. Smoking tobacco also dries the mouth and results in vitamin C deficiency, which can cause bad breath through gum disease. Alcohol dehydrates drinkers and kills the good bacteria in the mouth, and many alcoholic drinks supply bad oral bacteria with sugar, which fuels decay. Chronic halitosis can be caused by many conditions, but gum disease and tooth decay are at the top of the list. These two problems can result from poor dental hygiene and bad diet, such as nutrient deficiencies and excessive sugar. Acid reflux is another cause of halitosis. Stomach acid and contents can travel up into the esophagus and mouth, producing a sour taste and bad breath. In some cases, food may stay in the esophagus and decay. Diabetes and diets low in carbohydrates can also cause bad breath through ketone production. Local infections are major contributors to halitosis. Sinus infections can result in bad nasal breath and spread bacteria to the tonsils, which may also become infected separately. Tonsillitis often includes the presence of tonsil stones, which are clumps of food and bacteria that develop in pockets in the tonsils. Tonsil stones are a major cause of sulfurous bad breath that smells like rotten eggs. Prevention of basic bad breath is best done by changing diet and habits. For example, those who experience garlic breath can quit eating that food when fresh breath is important. 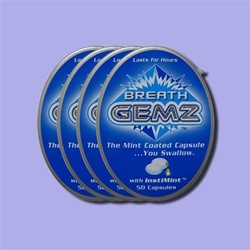 Alternatively, one can use dual-action breath fresheners, such as BreathGemz. Cutting down or quitting tobacco and alcohol can fight bad breath by raising salivary production. Dry mouth can also be reduced with saliva stimulation products, such as SalivaSure. Chronic halitosis can have many causes, so treatment depends on the condition behind the symptoms. When acid reflux is the cause, sufferers can reduce reflux by avoiding fatty meals, alcohol and tobacco. If mouth bacteria is the suspected cause, Dentiva lozenges nd DioxiRinse mouthwash can be used to restore health to the mouth. In cases of sinus infection, patients can flush out bacteria and foreign matter with sinus irrigation, such as Hydro-Pulse oral irrigator. Of course, it’s often difficult or impossible to know exactly what is causing chronic halitosis. For this reason, many people find that a combination of approaches works best. Bad breath and halitosis can ruin time spent with others. Fortunately, sufferers can take care of the problem with the solutions outlined above. No matter what is causing offensive breath, the right product will do wonders to freshen it, raising confidence and quality of life. About the Author: Dr. Anthony Dailley specializes in halitosis remedies. Dr Dailley runs a specialty halitosis clinic and conducts research related to cure bad breath in the Bay Area. Arrange an appointment with Dr. Dailley and be comfortable again!